The third season of the popular anime series to air within two hours after Japanese broadcast. 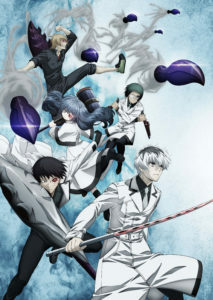 Southeast Asian anime channel ANIPLUS Asia has announced on their Facebook page on Monday that Tokyo Ghoul:re will be a part of the channel’s simulcast titles for this year’s Spring anime season. The upcoming anime will premiere on April 4, airing Every Wednesdays at 12:00am (11:00pm JKT/BKK), two hours after the initial Japanese television broadcast. The channel previously announced on Sunday that the upcoming anime series Persona 5 the Animation will also be a part of the channel’s simulcast title this season. Tokyo Ghoul:re is the third season of the popular Tokyo Ghoul anime series, which is based on the second spin-off manga of the popular series by Sui Ishida. The manga is being published in Shueisha’s Weekly Young Jump magazine since October 2014, which currently has 15 volumes. The upcoming anime will be directed by Odahiro Watanabe, who worked on several episodes of the comedy anime Beelzebub, replacing Shuhei Morita from previous two seasons, while Chuji Mikasano will once again handle the scripts. Character designs will now be handled by Atsuko Nakajima, who worked on several titles including GetBackers and Hakuoki, replacing Kazuhiro Miwa from previous two seasons, which will be produced once again by Pierrot.